US, 1959, 105 minutes, Black and white. Robert Mitchum, Elizabeth Muller, Stanley Baker, Gia Scala, Donald Wolfit, Kieron Moore. 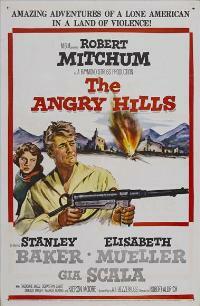 The Angry Hills is based on a novel by popular writer, Leon Uris (Exodus, Battle Cry, Trinity). The setting is 1941 with an American journalist finding himself in Greece and given information about Greek collaborators. This was not what he was searching for and he finds himself in a cat-and-mouse situation as he is pursued by the Nazis as well as helped by the Greek Resistance. Robert Mitchum plays the American journalist, a man who is not usually in a hurry in films, but is forced into cat-and-mouse pursuit as well as espionage. The Greeks are played by such actors as Gia Scala and Theodor Bikel. Stanley Baker is severe as Conrad Heisler who pursues the American journalist. There is an interesting British supporting cast including Leslie Phillips, Donald Wolfit, Marius Goring and Kieron Moore. The film can be compared to any range of espionage films especially those made in the period from Graham Greene stories like Confidential Agent as well as Hitchcock films like Foreign Correspondent. The film was directed by Robert Aldrich who had emerged on the scene with such films as The Big Knife and Kiss Me Deadly as well as westerns like Vera Cruz and Apache. He was to have a very strong career until the 1980s with strong films in the 60s and 70s, especially The Dirty Dozen and The Legend of Lylah Clare. 1. The significance of the title, its relationship to Greece, to the war? Was it evident that this film was made from Leon Uris's big novel? 2. How important was the Greek atmosphere for the film? The significance of the war in Greece? The use of locations, city and country? The film as a tribute to the Greeks during the war, their suffering and resistance? 3. How contrived was the film, in its plot, heroics, dialogue? How real was it? Or was it a contrived drama to portray themes of war? 4. Did the film give insight into men and women in war? The effect on their lives, its suddenness? What basic war themes did the film have - the British, the soldiers, journalists, the Greeks, spies, traitors, resistance? 5. What did the film have to say about patriotism, the conflicts of family loyalty, personal life, country? What did the film show of loyalty? In each of its main characters? The importance of being a traitor? Especially in the character of Tassos? The temptations for Lisa? The role of blackmail? What was the audience response of (to?) these themes of loyalty and infidelity to country? 6. Was the film fair in its presentation of the Greeks? Was it fair in its production of the English and Americans? In its presentation of the Germans? Were they over-heroic, villainous, caricatures? 7. How interesting a hero was Mike Morrison? How heroic was he, in response to situations and circumstances, fate, chance, growing involvement, coping with injuries, his response to resistance and to death? The impact of the Greek people in the hills, the effect of the raid and the betrayal? The importance of his escape? The effect of the death of hostages on his conscience and attitudes? The nature of his decisions? For Lisa? His decision to leave, attitude towards Heisler? 8. The impact of Tassos in the film? Was he a convincing traitor? The scenes of his cruelty, subservience to the Germans, betrayal of the Greeks? 9. Was Heisler convincing? His rose as a Gestapo man? His hardness, despising his job, his being blackmailed by the general, his yielding to Lisa, his confronting Morrison as regards death, his attitude towards Tassos and his despising of him? How interesting a Gestapo character was he? 10. Was the general a typical German general? Did he offer any insight into a Nazi general? 11. How attractive was Lisa? Her role in the Resistance, relationship to Heisler, temptation to betray Morrison, changing her mind, was this convincing? How convincing was her persuasion of Heisler and her happiness at the end? Was this a credible human behaviour? 12. How attractive and interesting were the people in the hills? Eleftheria, her love for Morrison, her help of him, her death? Andreas and the death of the Greeks in the raid, their betrayal? 13. How successful a war and adventure film was this? With insight into human nature?